Afghanistan continued their seemingly inexorable march to the World Twenty20 with a 14-run win over Scotland at Sheikh Zayed Stadium in Abu Dhabi. 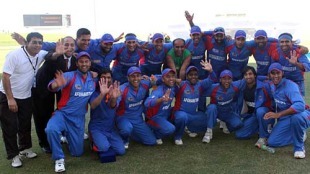 Noor Ali's blistering 42, when wickets were falling around him, provided the early impetus in Afghanistan's 131 for 7 and Shapoor Zadran's remarkable bowling - he conceded just eight runs in four overs - held Scotland at bay to ensure Afghanistan an all but certain passage into the Super Fours. Scotland's decision to field this morning appeared to have paid dividends when Gordon Drummond picked up Karim Sadiq and Shafiqullah in his first over, but Ali was unperturbed and crashed four fours and a six in his 42. With his partner striking the ball so cleanly, Mohammad Shahzad could afford to play a more sedate innings. His 30 contained just a single boundary, but he rotated the strike well in the 71-run partnership. Kyle Coetzer grabbed three quick wickets - including the hero of yesterday's game, Mohammad Nabi, first ball - to peg Afghanistan back, and when Samiullah Shenwari picked out Gavin Hamilton off Jan Stander in the 19th over, Afghanistan were struggling at 116 for 7. But a late surge from Raees Ahmadzai and Mirwais Ashraf took the score past 130 and gave Afghanistan's bowlers a decent total to defend. Scotland would have been hoping for a positive start to their chase, but Navdeep Poonia fell second ball to Ashraf, and Zadran proved almost impossible to get away in his opening spell. When Kyle Coetzer's painful innings ended on the first ball of the fifth over, he had struggled to two from 15 balls. Hamilton and Neil McCallum clawed their way back with a 66-run partnership for the third wicket, but when they were both dismissed in consecutive balls, Afghanistan had found their opening. Hamid Hassan bowled Jan Stander and Fraser Watts, and when Drummond and Simon Smith fell to Mohammad Nabi in the penultimate over, Scotland's hopes were extinguished. Hassan shattered Majid Haq's stumps with the last ball of the innings to seal an emphatic victory, sending Scotland crashing out of contention and Afghanistan almost certainly through to the next round. If they beat the USA and Scotland defeats Ireland, then the USA, Scotland and Ireland will be locked on two points each with net run-rate deciding which team joins Afghanistan in the Super Four stage from Group A.